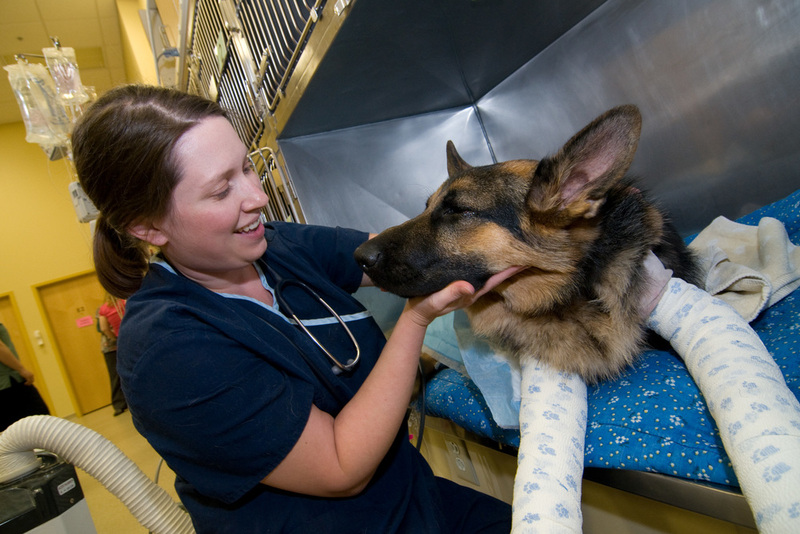 Why would your pet need VMC's surgical services? All aspects of veterinary medicine are rapidly advancing. This makes it difficult for veterinarians to remain current with the developments required to manage some of today's most complex surgical problems. If your pet is a high anesthetic risk, has a bleeding disorder, or requires specialized materials, techniques, or equipment, a surgical specialist may be your best option. Here at VMC, our normal surgical caseload includes patients with a wide range of orthopedic, soft tissue, neurologic, and oncologic (cancer) problems. Our staff is accustomed to patients with high anesthetic risk, including those requiring thoracic (chest) surgery or surgery involving major organs. We offer a range of minimally invasive procedures, including laparoscopy and arthroscopy. The safest anesthetic agents are used, and patients are continuously monitored throughout the anesthetic period. Experienced, licensed veterinary technicians and a well-trained technical support staff provide skilled and compassionate nursing care for your pet before, during, and after the surgical procedure. Pre-anesthetic blood tests are performed for surgical patients, and provide us with important information about your pet's ability to undergo anesthesia and surgery, thus decreasing the level of risk associated with the procedures. Radiographs (X-rays) are required prior to surgery for some procedures. Patients are mildly sedated to fully anesthetized for these radiographs, to allow for diagnostic quality images and to reduce stress and discomfort for your pet. Patients are given a combination of anesthetics and pain medications. Vital statistics are monitored closely by Licensed Veterinary Technicians for the entire procedure. 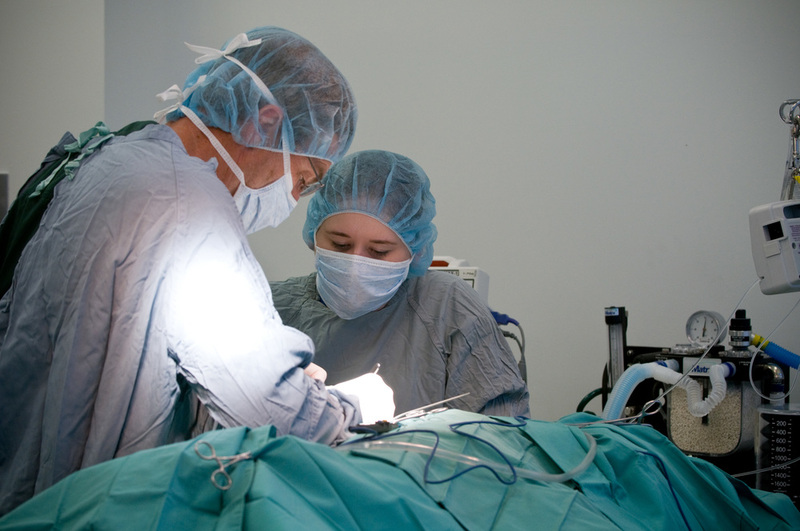 Preparation of the surgical site is performed once the patient is completely anesthetized. The site is shaved and then scrubbed with antiseptic solutions. The surgeon and surgical scrub assistant (a Licensed Veterinary Technician or veterinarian) scrub in a specialized area outside the surgical suite. Caps, gowns, masks, and shoe covers are worn. Traffic is restricted in and around the surgical suite. The patient is moved to the surgical suite, positioned on the surgical table, and the monitoring equipment is adjusted. The surgeon organizes the sterile surgical instruments in preparation for the surgery to begin. Surgery begins. Sterile drapes are used to establish a sterile field that minimizes contamination. The surgical suite has access to sterile supplies, sterilizing devices, fluid and blanket warmers, and other equipment. Equipment and monitoring devices are positioned strategically for efficient patient care. A designated Licensed Veterinary Technician constantly monitors the patient’s vital signs throughout the entire procedure. After surgery, patients are moved to a cushioned area for recovery, and warming blankets are used if needed. A Licensed Veterinary Technician provides comfort and human contact, staying with your pet until your pet is stable and fully conscious. This pet is awake and getting a visit from Dr. Robinson. Postsurgical patients are carefully monitored for their entire stay. Your pet will have an individualized pain control plan to provide optimal comfort after surgery. I know there are other board certified surgeons in the Syracuse area. How is VMC different from other surgeons? Other surgical referral facilities may not offer overnight post surgical care with an onsite veterinarian present at all times. Our veterinarians and technicians are prepared to address any post-surgical complications or to quickly initiate changes in pain management--whether it's at 2pm or 2am. 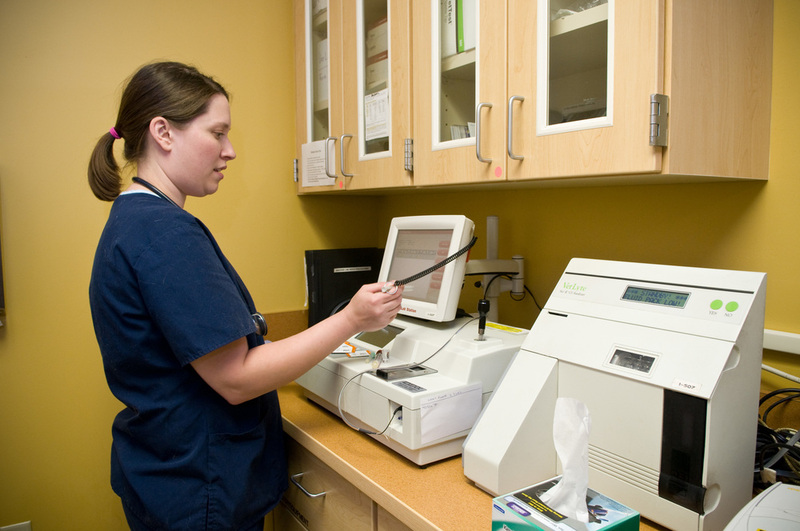 The VMC of CNY is the only facility in the Syracuse area that maintains 24-hour care managed by on-site veterinarians and licensed technicians for their patients. Our facility is appropriately staffed with veterinarians, licensed veterinary technicians, and assistants 365 days per year, 7 days per week, 24 hours per day. Our Imaging service to provide advanced and timely diagnostics including ultrasound, CT and MRI that define and localize tumors, masses and other disorders. Our Critical Care service to assist in treating critically ill, compromised patients requiring life-saving surgeries. The CARE Pet Therapy team to assist in developing multi-modal therapies to eliminate or control pain in all surgical cases and to develop post-surgical rehabilitation plans.